Netanyahu on Capitol Hill in 2011. The United States and Israel have a special relationship in many ways. For one thing, it’s hard to think of another pair of countries whose leaders are as willing to insert themselves into each other’s political debates or use the other country’s leaders as election props. 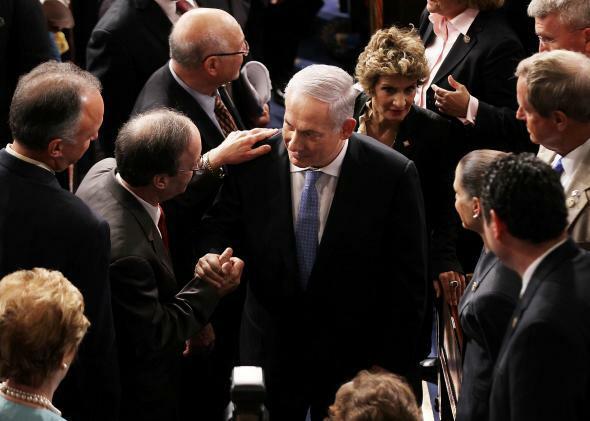 On Wednesday, House Speaker John Boehner invited Israeli Prime Minister Benjamin Netanyahu to address Congress next month and no doubt deliver a scathing critique of the Obama administration’s Iran policy. As Russell Berman of the Atlantic notes, this will make Netanyahu the first foreign leader since Winston Churchill to address Congress three times. The last time, in 2011, he was interrupted more than two dozen times by standing ovations. This is smart politics for the Republicans. The public largely supports Obama’s efforts to reach a diplomatic settlement with Iran over its nuclear policy, but not as much as it supports a strong relationship with Israel. Netanyahu has a keen understanding of the U.S. public and can deliver a barnburner of a speech, particularly when it comes to what he sees as an existential threat to Israel’s safety. If anyone can rally opposition to a deal, it’s Bibi. The speech will also come just a month before the next Knesset elections. This would appear to make it a win-win: Republicans get a high-profile attack on Obama’s foreign-policy, Netanyahu gets to follow up his domestically popular visit to Paris in the wake of terrorist attacks with what’s sure to be a rapturously received appearance before the world’s most powerful legislative body. Netanyahu’s opponents have attacked him for allowing relations with the White House to fray. As Berman notes, the last time Netanyahu was running for office, in 2013, his Likud party expressed irritation at what they saw as strategically timed White House leaks meant to undermine him. This time, it’s a bit different, as it’s Congress rather than the White House throwing Netanyahu a helping hand. This is partly a reflection of Netanyahu’s ties to the Republicans, but not entirely. The prime minister received standing ovations from both sides of the aisle in 2011, and some congressional Democrats, including Sen. Robert Menendez of New Jersey, have been just as blistering in their criticism of the Iran talks as Republicans. But it does reflect the prime minister’s increasingly dismissive attitude toward this White House. Jeffrey Goldberg reported last October that according to senior Israeli officials, Netanyahu has all but “written off” the Obama administration and prefers to deal directly with Congress. The administration will take Netanyahu’s speech as yet another slap in the face. The White House is reportedly irritated that it heard about today’s invitation from Boehner’s office rather than the Israeli government. Netanyahu may not care all that much: Obama will be gone in two years anyway. But things may not necessarily improve for him after 2016. Hillary Clinton (in contrast to her husband, who’s clearly not a fan) has defended Netanyahu from criticism. But she’s also avoided opportunities to distance herself from the White House on the main issue at hand: Iran policy. Democratic voters were also quite critical of Israel’s actions in Gaza last summer. Barring a Rand Paul scenario, Netanyahu will likely get a White House more to his liking if the Republicans win in 2016. Though the last time he bet big on their victory, it didn’t turn out so well.